If you just want to do basic grilling of hamburgers and hot dogs, then an average grill will work just fine for you and will not cost that much. If you are really into outdoor grilling and what to grill things like steaks, tuna, turkey and more to perfection then be ready to spend a spent a lot more for a truly powerful grilling setup. In addition, a top end outdoor luxury grill will make it easier to grill for larger groups of people. The more solid construction, the higher the life expectancy of the grill. Most high-end luxury grilling machines are made of 304-grade stainless steel that lasts a lifetime. Some brands also mix titanium with stainless steel to add much more durability. Most inexpensive grilling machines do not have this option highlighted but the high-end ones do have a grease manager that won’t let the grease fall to the open flame that creates flare-ups. The grease is routed to another section of the grilling machine. 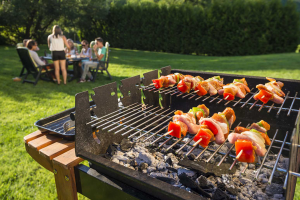 Normally, when shopping for an outdoor grill, people consider its size so they can cook more in less time. Well, with size, the shape of the cooking grates matters as well. For instance, a rectangular cooking grate will have less cooking space as compared to a hexagonal one. High-end grills that provide real luxury usually have a dedicated sear burner on the sides or the back that can help you to preserve the natural juices like a professional. Unlike cheap grilling machines, luxury ones are equipped with an adequate hood-assist system that use springs or other mechanisms to help you lift the hood easily and lock it in a fixed position, so it doesn’t just slam back on the cooking area. To make the grilling experience real luxurious, it is recommended that you opt for ceramic briquettes as they heat evenly and provide a constant flame. Integrated rotisserie on luxury grilling machines assists you in roasting your food by skewering on a spit. It cooks the food slowly while you enjoy grilling your favorite mouth-watering food. Various luxury grilling machines typically come with additional accessories such as a griddle, smoker, etc. The Bh1-30r-n by DCS has a 553square-inch cooking surface along with a rotisserie to help you cook the food slowly and evenly, preserving all the juices inside. This grilling machine uses ceramic heating technology that distributes an equal amount of heat throughout the heating area so you can cook evenly. It also has twin side shelves on which you can put anything that you want to keep at hand. It has dual stainless-steel burners that provide up to 25,000 BTU of heat (total 50,000 BTU of heat). The grills are 30inch in size and work on propane gas. It is entirely constructed of 304-grade stainless steel for long lasting durability. The 9-volt battery ignition on this grill also makes it easy and safe to turn the lighting on. The E790i A-series by Fire Magic Grills packs 3 stainless steel gas burners that together provide 792 square inches of cooking surface. The overall construction is made sturdy enough by using 304-grade stainless steel so you can use it for a lifetime. It is also equipped with a super high torque motor rotisserie to cook tender and juicy food. There is an analog thermometer mounted on the hood with polished bezels to make the heat management much easier. The quantum foam rotisserie backburner provides up to 13,000 BTU while the total heat this grilling machine provides is 112,000 BTU. If you want to cook in a professional way and love the restaurant-style sear marks, then this grilling machine should be in your consideration. If you can afford the real luxury then this 54inch 304-grade stainless steel grill should be on your list for sure. It contains 4 stainless steel burners that provide 25,000 BTU each 100,000 BTU total). The grill works on high-end ceramic briquettes that provide direct heat for an excellent cooking experience. It’s cooking grate is hexagonal that offer 20% more mass to absorb, retain, and conduct more heat into your food. The main grilling area of this machine is 760 square inches, which is sufficient enough to cook for a big family. On the base of the grilling machine, you will find soft closing doors with a flush handle design that give you storage for storing accessories. It uses natural gas and is equipped with exterior ambient LED lights for enhanced luxury. Alfresco is a name that represents luxury, and masterpiece grilling experience. The ALX2-56C by Alfresco Grills is made from all commercial-grade stainless steel with no mechanical fasteners that will provide you lifelong grilling. The body is seamless and has a double skin on the front and the back. The hood of this grill has hand-polished accents for a royal and durable look. The pyramid-shaped porcelain ceramic briquettes help distribute even heating; which means you won’t face any problem when it comes to making evenly cooked food. Its control panel can also be easily opened without any tools for quick maintenance. To keep the front panel surfaces and ignition cool, the ALX2-56C features a natural air-cooling curtain. If you have poor lighting condition then don’t worry, this grilling machine has integrated high-intensity halogen work light that is angled towards the center to provide even illumination throughout the cooking area. This egg-shaped grilling machine by KamadoJoe has a thick-walled hard outer shell that ensures the food inside remains evenly moisturized and well-smoked at any temperature. You can cook a variety of food on its various cooking surfaces according to the temperature requirements. we can also say that this grilling machine is relatively a modern version of the tandoor. It offers a stainless steel latch that stays tightly closed enabling you to cook food without losing any heat. The top vent on this grill is patented and made with aluminum that provides resistance against rust and rain and excels at airflow management. The heat range on it ranges from 225°F to 750°F. In short, if you want to enjoy a versatile grilling experience at a good cost then the KJ23RHC by KamadoJoe is made for you. It is one of the most unique grills out there in the market that is 40 inches wide and 38inch high with a cooking area of 1,257 square feet, isn’t that something? It is water-proof, rust-proof, and can be left outside year round without needing any kind of maintenance. You can light it up by using either wood or charcoal (choice is completely yours). It is made in the USA with US steel that provides extra durability when it comes to lifelong working. It can easily cook for about 50 to 75 people. The heat pattern of this grill is quite simple; you have to build a wood or charcoal fire in the center of the grill and the heat will evenly distribute from the center out. One of the best things about it is that if you do not want to use it as a grill, you can use it as a fire bowl with the cooktop on or off. Its corten steel construction requires little or no maintenance at all. It is the second most expensive grill on our list after the Alfresco one. The AMG36-LP has a 1,105 square inches of cooking surface with a grill that is designed for dual fuel, which means it can be used with either wood/charcoal or propane gas. Its sturdy body is constructed with 304-grade stainless steel with 16-gauge double-lined hood for additional durability that lasts a lifetime. The V-shaped cooking grates also provide a sufficient amount of space to cook various things at a time. As its name says, this grill was modeled after the 1969 Shelby GT 350 Mustang to give a strong and powerful look. It features an extraordinary design that you won’t be able to see in every grill out there. It has exterior LED lighting with interior cooking lights that adds to its amazing design. A drip pan is also equipped in it that makes sure the grease doesn’t get directed to the flame. You will also get additional accessories with the grill including BBQ gloves and multi-purpose grill tool. However, the grill is intended for propane gas for optimum results. All the grills mentioned above are chosen by keeping luxury and quality performance in mind. Make sure you review the features of each grill before worrying about the price. You can then opt for the one that perfectly aligns with your requirements. However, if you are looking for versatility, you should go for the KamadoJoe KJ23RHC Classic II. If luxury is your thing and you want the most amazing grill out there then you should consider buying either the American Muscle AMG36-LP-AMG36-CART or the Alfresco ALX2-56C.